I had noticed few months back that fruit bats visiting Indian Almond Tree (Terminalia catappa) in my backyard were hunted by some animal. I initially thought it is work of domestic cats, but the claw marks on the bark of the tree pointed different animal. After I found Besra feeding on large Garden lizard, my suspicion that it is a lizard of some kind grew stronger. That evening I was trying to photograph birds which frequent our garden. That when I saw cat jumping up the Almond tree to chase this large lizard. Lizard jumped to the ground and stood there threatening the cat by arching its back and hissing. 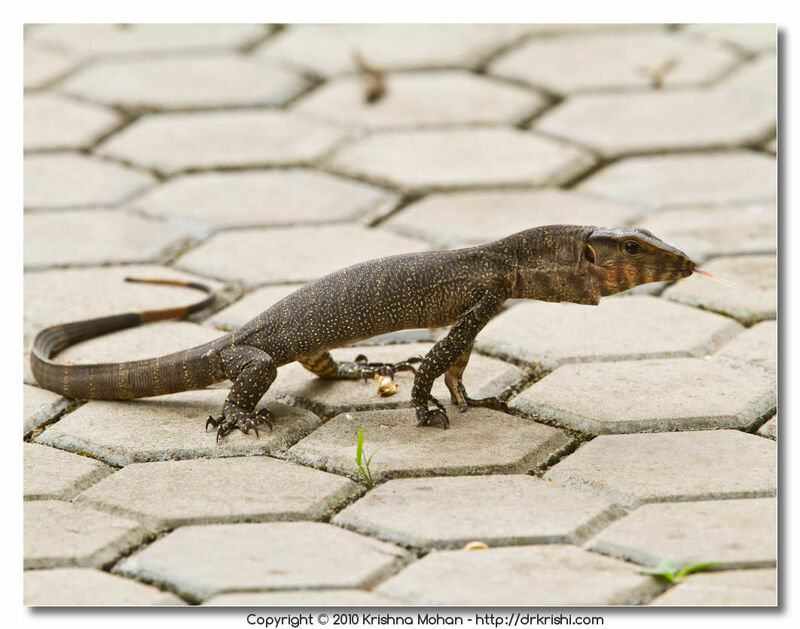 Common Indian Monitor (Varanus bengalensis) or Bengal monitor, is a monitor lizard found widely distributed over South Asia. 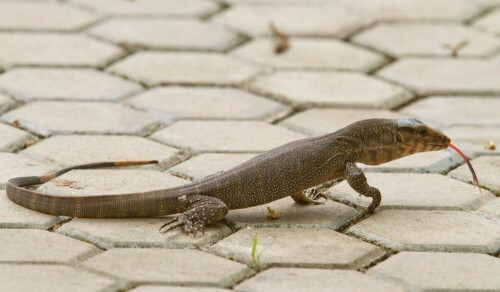 This large lizard is mainly terrestrial and grows to about 175 cm from the tip of the snout to the end of the tail. Young monitors may be more arboreal but adults mainly hunt on the ground preying mainly on arthropods but also taking small terrestrial vertebrates, ground birds, eggs and fish. Although large monitors have few predators apart from humans who hunt them for meat, younger individuals are hunted by many predators. During my student days I had a pet Bengal monitor, which was saved from clutches of hunters at Bantamale Forest near here. We had gone there for trekking where we saw this huge monitor lizard which hid in a tree hole. The locals were cutting the dry trunk to extract this monitor lizard and wanted to cook it. After lot of cajoling and pursuing with them they agreed to give us the lizard live. I was living in a rented house with few of my colleagues during those days at Mangalore studying MBBS. 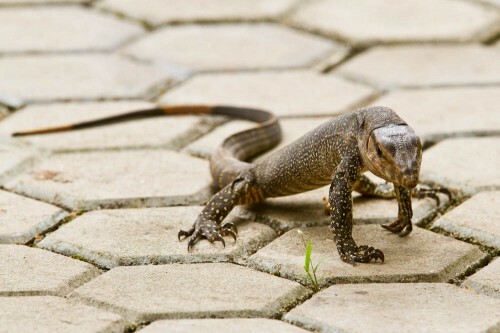 My landlady was very angry as I had bought a monitor lizard to her house, as she believed it a bad omen to have a monitor lizard coming to her house. I had to explain to her that it did not come on its own, we bought it there, so it is not a bad omen. It was very peaceful pet except during feeding time when it used to turn aggressive. We were feeding meat pieces as we could not afford live feed for it. After few days it started eating from our hands, allowed us to touch and handle it though the claws and teeth looked menacing. After 3 months I released it to the wild when I got few more similar exotic pets to look after. 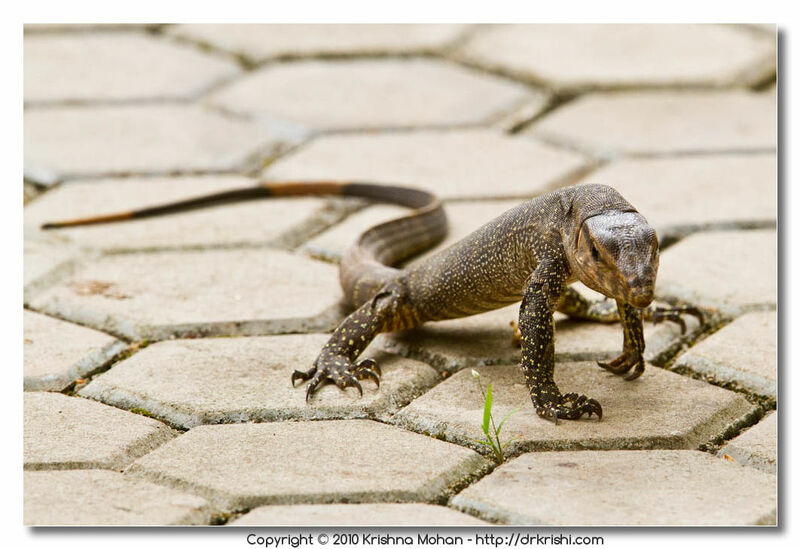 Young monitor lizards are more colourful than adults. Young have a series of dark crossbars on the neck, throat and back. The belly is white, banded with dark crossbars and are spotted with grey or yellow (particularly in the eastern part of the range). On the dorsal surface of young monitors, there are a series of yellow spots with dark transverse bars connecting them. As they grow up the ground colour becomes light brown or grey and dark spots give them a speckled appearance. Bengal monitors have an external nostril opening or nare that is slit like and oriented near horizontal and positions between the eye and the tip of the snout. The nares can be closed at will especially to keep away debris or water. 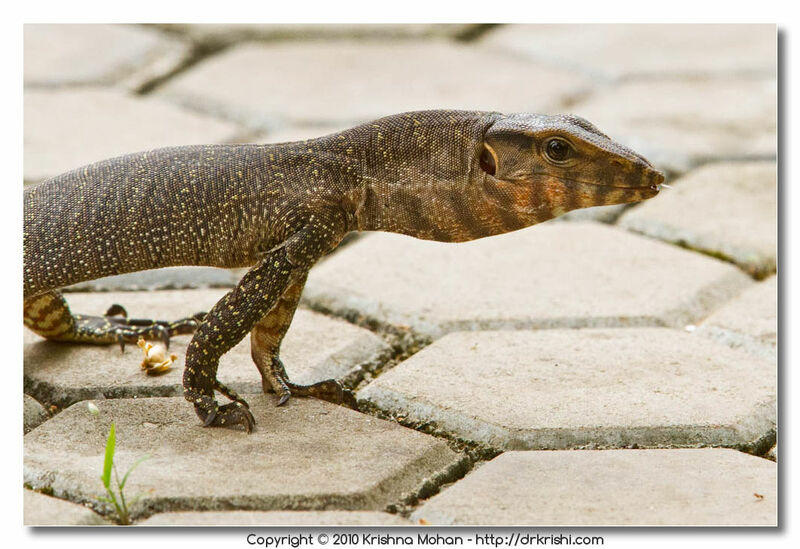 Like other varanids, Bengal monitors have a forked tongue that is protruded in the manner of snakes. The function is mainly sensory and is not very involved in the transport of food down the throat. Bengal monitors have fat deposits in the tail and body that serve them in conditions when prey are not easily available. The lungs have spongy tissue unlike the sacs of other saurians. This allows for greater rates of gas exchange and allow a faster metabolic rate and higher activity levels. Like all varanids, they have subpleurodont teeth, meaning that the teeth are fused to the inside of the jaw bones. The teeth are placed one behind another and there are replacement teeth behind and between each functional tooth (polyphyodont). The maxillary and dentary teeth are laterally compressed, sometimes with a slightly serrate cutting edge while the premaxillary teeth are conical. There are 78 premaxillary teeth, 10 maxillary and 13 dentary teeth. Replacement teeth move forward and about 4 replacements happens each year for a tooth. 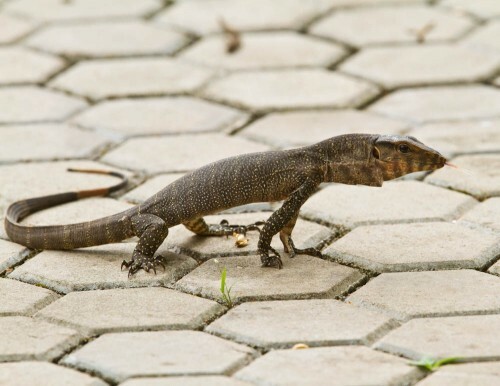 There are mandibular glands that produce secretions at the base of the teeth and although some varanids have been shown to have a venom, no toxicity has been reported in the Bengal monitor. Folk belief has it that they are venomous and in Sri Lanka it is believed that their breath is poisonous. 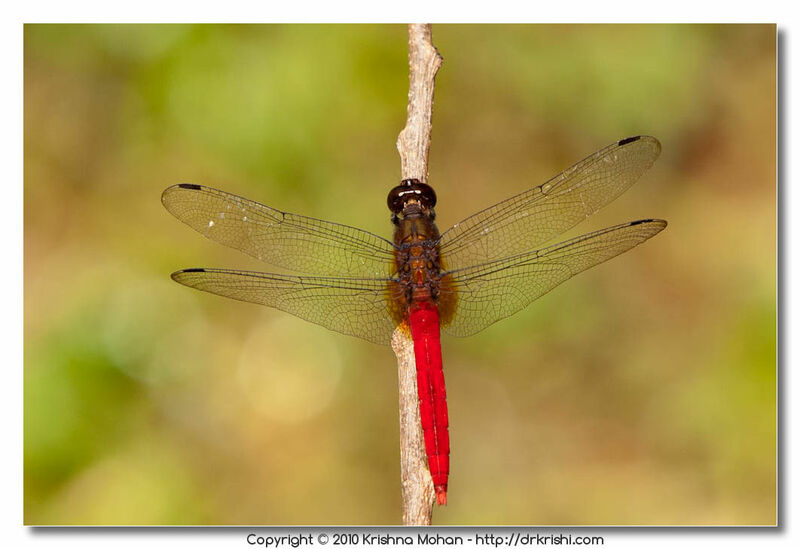 In Rajasthan, it is believed that they are venomous only during the rainy season. 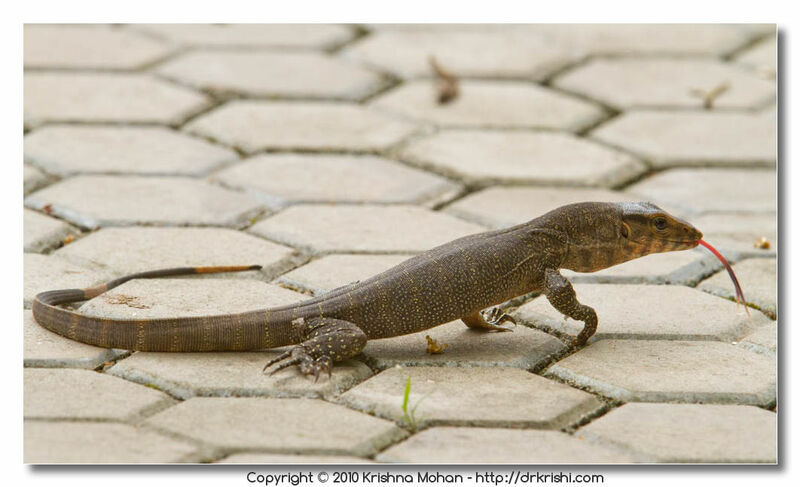 Bengal Monitors are usually solitary and usually found on the ground although the young are often seen on trees. Bengal monitors shelter in burrows that they dig or crevices in rocks and buildings, whilst clouded monitors prefer tree hollows. Both races will make use of abandoned termite mounds. Bengal monitors, like other varanids show true sleep at night and are diurnal, becoming active at around 6 AM and bask in the morning sun. They are usually shy and avoid humans. They have keen eyesight and can detect human movement nearly 250 m away. When caught a few individuals may bite but rarely do so. Captives have been known to live for nearly 22 years. Large adults may ascend vertical tree trunks where they sometimes stalk and capture roosting bats. Their normal prey consists of beetles, grubs, orthopterans, scorpions, snails, ants and other invertebrates. Vertebrate prey is comparatively rare and includes frogs, fish, lizards, snakes and rodents. They sometimes feed on dead animals. EXIF info - Aperture : ƒ/6.3 | Camera : Canon EOS 7D | Taken : 28 November, 2010 | Flash fired : no | Focal length : 420mm | ISO : 640 | Location : 13° 4′ 2.1972″ N 74° 59′ 43.881360019291″ E | Shutter speed : 1/640s | Images and content Copyright © Krishna Mohan. Please contact me to purchase prints or for image publication license. Oh, the ‘Odu’! 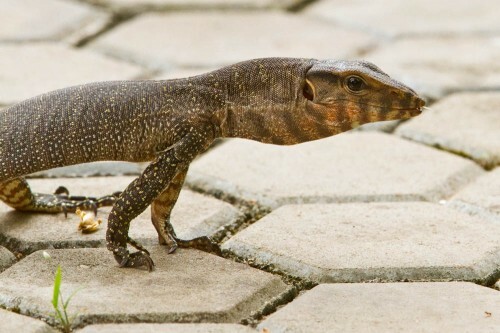 Looks like a miniature Comodo Dragon. Seems like he was facing the cam for just a moment before running for cover. Some contrast and slightly less brightness might have been helpful to bring out the texture of the skin I guess. ಹಿತ್ತಿಲಿನ ಒಂದು ಬಡ ಉಡ ಹಿಡ್ಕೊಂಡು ಎಷ್ಟು ಚಂದದ ಲೇಕಹನ ಮಾಡಿದ್ದೀರಿ – ಶಬ್ಬಾಸ್! ಕೆಲವು ವರ್ಷ ಹಿ೦ದೆ ಮಳೆಗಾಲದ ಆರ೦ಭದಲ್ಲೊಮ್ಮೆ ಉಡ ಜೋಡಿಯ ಪ್ರಣಯದಾಟ,ತೋಟದ ಕಣಿಯಲ್ಲಿ ಕ೦ಡಿದ್ದೆ, ಸುಮಾರು ೫ – ೬ ನಿಮಿಷಗಳ ಕಾಲ, ೫೦ – ೬೦ ಅಡಿ ದೂರ ಅವು “ಮಡೆಸ್ನಾನ” ಮಾಡಿದ್ದವು ! ಹಲವು ಬಾರಿ ಅವು ತೋಡಿನ ಬದಿಯ ಮಾಟೆಯೊಳಗಿ೦ದ ಏಡಿಗಳನ್ನು ತಿನ್ನುವ ಶಬ್ದ, ನಾವು ಚಕ್ಕುಲಿ, ಸೆ೦ಡಿಗೆ ತಿನ್ನುವ೦ತೆ, ಕೇಳಿದ್ದೇನೆ. ನೀವ೦ದ೦ತೆ ಅವುಗಳ ದೃಷ್ಟಿ ಚುರುಕು ಇರಬಹುದೇನೋ, ಆದರೆ ಕಿವಿ ಅಷ್ಟೇನೂ ಚುರುದು ಇಲ್ಲಾ೦ತ ನನ್ನ ಭಾವನೆ, ಏಕೆ೦ದರೆ ಮಾಮೂಲಿಯಲ್ಲದ ಸಮಯದಲ್ಲಿ, ಹೆಚ್ಚಾಗಿ ಮದ್ಯಾಹ್ನ ೨ – ೩ ಘ೦ಟೆ ಸಮಯದಲ್ಲಿ, ಕೇವಲ ೪ – ೫ ಅಡಿ ದೂರದಲ್ಲಿ ಅವು ಕಾಣಲು ಸಿಗುವುದು ಅಪರೂಪವೇನಲ್ಲ. ನನ್ನ ಭಾವನೆಯಲ್ಲಿ, ಇದು ಸಾಮಾನ್ಯವಾಗಿ ನಾವು ಅರಣೆ ಎನ್ನುತ್ತೇವಲ್ಲಾ, ಅದರ ಬೃಹದ್ರೂಪಿ ದೊಡ್ಡಣ್ಣ. ಏನ೦ತೀರಿ ? ಬಹಳಷ್ಟು ಮಾಹಿತಿ ಎಷ್ಟು ಚೆನ್ನಾಗಿ ನೀಡಿದ್ದೀರಿ. ವ೦ದನೆಗಳು. I happen to have one in neighborhood. Have given some details and photos below. While searching for info online came across your blog, it is very informative. I did mention it in the blog. Also great blog and great work here.